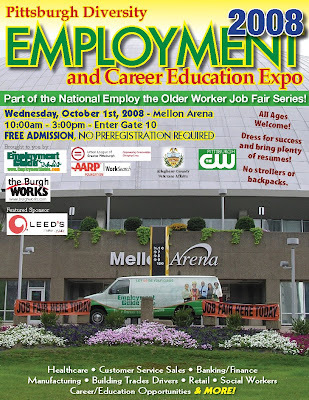 The autumn edition of the Pittsburgh Diversity Employment and Career Education Expo is set for October 1st from 10:00AM to 3:00PM at Mellon Arena. A company list is posted below. As part of the National Employ the Older Worker Job Fair Series in conjunction with AARP Foundation WorkSearch, this event will also be held in conjunction with the Allegheny County Department of Veteran’s Affairs and The Urban League of Greater Pittsburgh. All ages are welcome and encouraged to attend. No pre-registration is required and admission is free to all job seekers. We only ask that you come dressed for success and bring plenty of resumes. Parking at the arena, if you drive, costs from $5.95 to $7.95 for all day depending on which lot you use. Of course, Mellon Arena is serviced very well by public transportation, making this event easy to get to. All job seekers who attend will be eligible to win one of 4 $50.00 gas cards to be given away at the top of each hour -11:00AM, 12:00 noon, 1:00PM and 2:00PM. As you come into the job fair (enter gate 10) you will be given a ticket to be used for the drawings. Companies will primarily be looking for hourly, entry level up to mid-level skilled positions in Healthcare, Nursing, Sales, Customer Service, Social Services, Retail, Hospitality, Finance / Banking, the Building Trades and more. Coventry Healthcare / Health America, PA Mentor, Advance Auto Parts, Mainstay Life Services, U.S. Navy, SMG, Aramark, PA Army National Guard, H&R Block, Aldi, Community College of Allegheny County, New Century Careers, CVS/Caremark, City of Pittsburgh Diversity 365, Giant Eagle Market District, CCAC Most, All-State Career, The Empyrean Group, Liberty USA, Builders Guild of Western PA, Everest Institute, Giant Eagle Getgo, Transitional Services, Life Pittsburgh, Verizon Wireless, Carnegie Mellon Facilities Management, CEP/Clayton Academy, Kaplan Career Institute, Leed's and more.